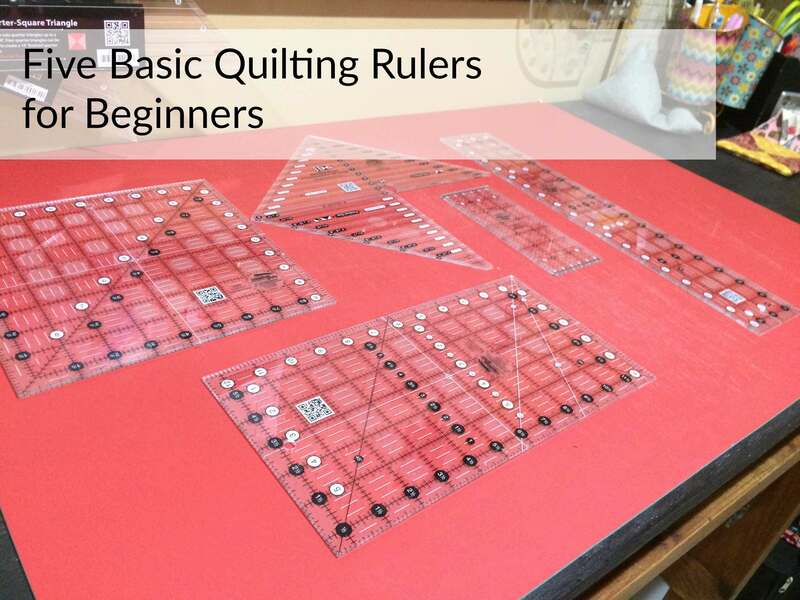 A friend recently asked me what rotary cutting tools I would recommend to a beginner, so I decided to post a partial answer to that question by discussing my top five basic quilting rulers. 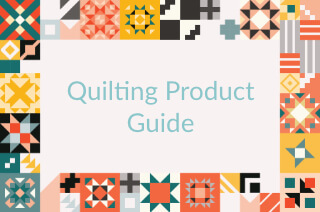 If you are looking for information about all the basic tools you need to get started quilting, please see this post on Tools and Equipment. This post will be strictly about BASIC rulers. (I will try to post about my favorite specialty rulers later.) In my mind, basic rulers are those rulers I grab most often when cutting fabric. The five rulers I describe below are what I consider my work horses, and with each description I will tell you why I think they are indispensable. 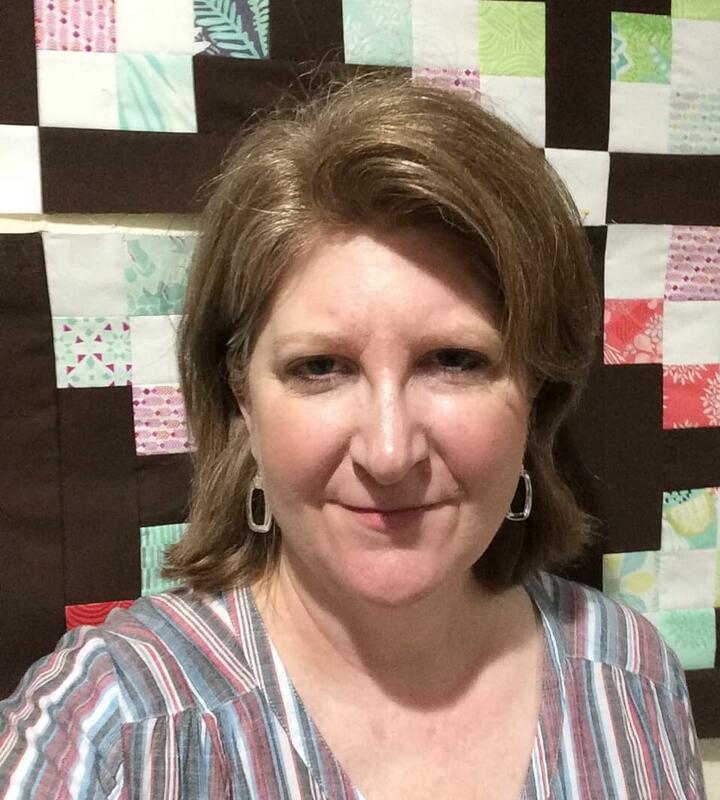 The quilting world is FULL of paraphernalia. They are clear, and I can see through them perfectly, enabling me to precisely line up fabric. They do not slip. They have these little circles built into them on the bottom that grab fabric which keeps them from sliding around. They are incredibly accurate. One thing I noticed from working with lots of different ruler brands is they are not always true to each other. 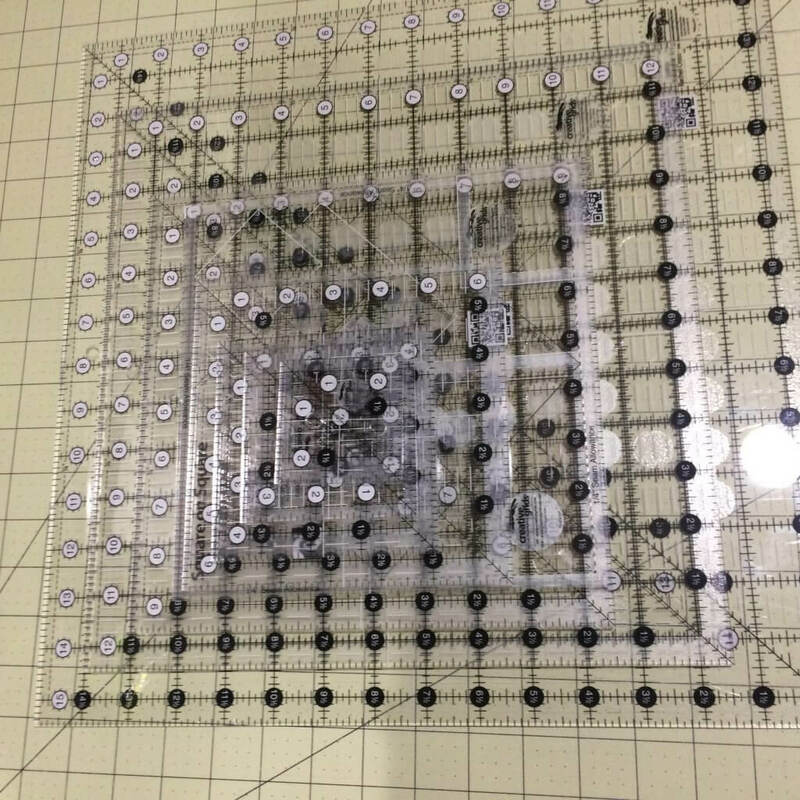 If you hold up a Creative Grids ruler with another Creative Grids ruler, the markings will always line up with each other. NOTE: Creative Grids is not sponsoring me to endorse their products. I simply love them. However, the links below is are affiliate links, which means that if you click a link and choose to make a purchase, I will earn a commission. This commission comes at no additional cost to you. Please know that I only link to items which I personally use and feel that I can confidently endorse. So, without any further delay or explanation, these are the rulers I would take if I could only take 5 basic quilting rulers with me on a trip. You need at least one good square-up ruler when you begin making patchwork. Ideally, you should buy one that is the same size as the blocks in your project. So if your project is making 9″ finished blocks, you should get an 9.5″ Square-up ruler. If you don’t know what size your project calls for, a 9.5″ square ruler is a good one to start off with. It’s possible to work out how to square up smaller blocks with a larger ruler. But I do recommend you getting one to fit your project if you can. A good square up ruler should have a diagonal line that goes through the center of the ruler. This is very helpful when patchwork pieces in the block follow the diagonal, and helps you get a “truer” square. To improve accuracy with all types of rotary cutting, try to make sure your ruler fits the job. In other words, use the smallest ruler possible to get the job done. This ruler is a must have for cutting borders, narrow strips and squaring up a quilt edge before binding. I’ve found that the Creative Grids 6.5″ x 12.5″ ruler is the one ruler I reach for the most. It’s a nice size for working with Fat Quarters, and it’s great for when a pattern asks me to cut wider strips up to 6.5″ wide. Also, if fabric is folded in half one time towards the selvedge, this ruler is the perfect size for working with that width of fabric. Often when making basic units, I will need to trim up an edge. A large bulky ruler just gets in the way. This little guy, weighing in at 3″ x 7″, is the perfect size for this job. Creative Grids calls this ruler the “Itty Bitty Eighths” ruler because the 1/8″ markings are very clearly marked. When you are just getting started, you may not use 1/8″ marking much, but down the road, this ruler becomes very useful. Ok, a purist might argue with me, because some would call this one a specialty ruler. But in my mind it’s a basic, because HST’s and QST’s are basic units that I make a lot! There are several techniques for making these units and you can read all about them in the basic unit section of my Block Library, but my preferred method is using these rulers. Originally I started out with two rulers, but Creative Grids now offers a combo ruler. (Actually they offer the combo ruler in two sizes.) I’m going to link you up with both of them, but also including links to the individual rulers. I know, technically that makes 6 rulers, right? Okay, so there you have my 5 basic quilting rulers. Anybody else out there know of another ruler that I ought to consider my basic? If so, please let me know about it in the comment.